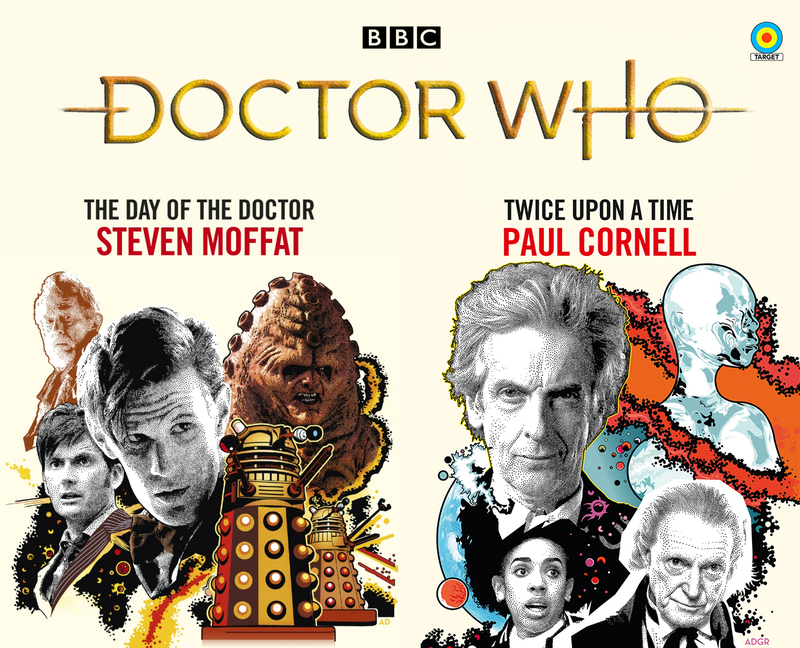 Back in the 1970s, ’80s, and ’90s, nearly every serial from the classic run of Doctor Who was novelized in one way or another through a range of books published by Target Books. That practice was discontinued when the show returned in 2005, mainly due to how readily available various home video formats were. It’s a shame because many of those classic novelizations ended up being better than the televised versions (mainly because a novel doesn’t have the budget constraints of a science fiction show made on a shoestring budget in the mid-1970s). Then, just a few months ago, BBC Books decided to revive the range for a brief five-book run. Like the old range, they brought back the writers of some of the episodes while mixing it adaptations from other writers. The books adapted for this new range were Rose by Russell T. Davies (the writer of the episode), The Christmas Invasion by Jenny T. Colgan (based on a script by Russell T. Davies), The Day of the Doctor by Steven Moffat (the writer of the episode), and Twice Upon a Time by Paul Cornell (based on a script by Steven Moffat). This review, however, will be focusing on the latter two books: The Day of the Doctor and Twice Upon a Time. Doctor Who: Day of the Doctor (by Steven Moffat): When the entire universe is at stake, three different Doctors will unite to save it. The Tenth Doctor is hunting shape-shifting Zygons in Elizabethan England. The Eleventh is investigating a rift in space-time in the present day. And one other – the man they used to be but never speak of – is fighting the Daleks in the darkest days of the Time War. Driven by demons and despair, this battle-scarred Doctor is set to take a devastating decision that will threaten the survival of the entire universe… a decision that not even a Time Lord can take alone. On this day, the Doctor’s different incarnations will come together to save the Earth… to save the universe… and to save his soul. Doctor Who: Twice Upon a Time (by Paul Cornell): Still reeling from his encounter with the Cybermen, the First Doctor stumbles through the bitter Antarctic wind, resisting the approaching regeneration with all his strength. But as he fights his way through the snowdrifts, he comes across the familiar shape of a blue police box, and a mysterious figure who introduces himself as the Doctor… Thrown together at their most vulnerable moments, the two Doctors must discover why the snowflakes are suspended in the sky, why a First World War Captain has been lifted from his time stream moments before his death, and who is the mysterious Glass Woman who knows their true name. The Doctor is reunited with Bill, but is she all she seems? And can he hold out against the coming regeneration? Portkey Games and Warner Bros. recently released an early access/beta version of the upcoming mobile game Harry Potter: Hogwarts Mystery. Set in the decade before Harry Potter attended Hogwarts, Harry Potter: Hogwarts Mystery allows players to create their own characters and experience life as a student at Hogwarts while living their own adventure – featuring a new story set in the universe of J.K. Rowling’s Wizarding World – and encountering familiar characters along the way, such as Professor Dumbledore, Professor Snape, Professor McGonagall, Professor Flitwick, Bill Weasley, Nymphadora Tonks, and more. The game is the mobile game equivalent of a touch-and-click adventure where players tap various items on the screen to advance the story forward while collecting experience and other materials all under the confines of an energy meter system. What happens when you take the central premise of loads of murder mysteries – a group of people who end up locked in a house as they start dying one by one – and replace that group with a group of actors/theatre people? Well, you get Act One, Scene One – Murder, the second novel in A.H. Richardson’s mystery novels starring Sir. Victor Hazlitt and actor Berry Beresford. A friendly desert community where the sun is hot, the moon is beautiful, and citizens keep disappearing, leaving behind nothing but pits of warm, scorched earth. This is the world of It Devours! : A Welcome to Night Vale Novel. Written by Joseph Fink and Jeffrey Cranor and based on the popular podcast, Welcome to Night Vale, It Devours! is a new page-turning mystery about science, faith, love, and belonging, set in a friendly desert community where ghosts, angels, aliens, and government conspiracies are commonplace parts of everyday life. It explores the intersections of faith and science, the growing relationship between two young people who want desperately to trust each other, and the terrifying, toothy power of the Smiling God. Nilanjana Sikdar is an outsider to the town of Night Vale. Working for Carlos, the town’s top scientist, she relies on fact and logic as her guiding principles. But all of that is put into question when Carlos gives her a special assignment investigating a mysterious rumbling in the desert wasteland outside of town. This investigation leads her to the Joyous Congregation of the Smiling God, and to Darryl, one of its most committed members. Caught between her beliefs in the ultimate power of science and her growing attraction to Darryl, she begins to suspect the Congregation is planning a ritual that could threaten the lives of everyone in town. Nilanjana and Darryl must search for common ground between their very different worldviews as they are faced with the Congregation’s darkest and most terrible secret.